Born September, 18, 1925, in Indian Mound, TN in Dekalb Co. She was a daughter of the late James Everette Wright and the late Effie Mae Henderson Wright. 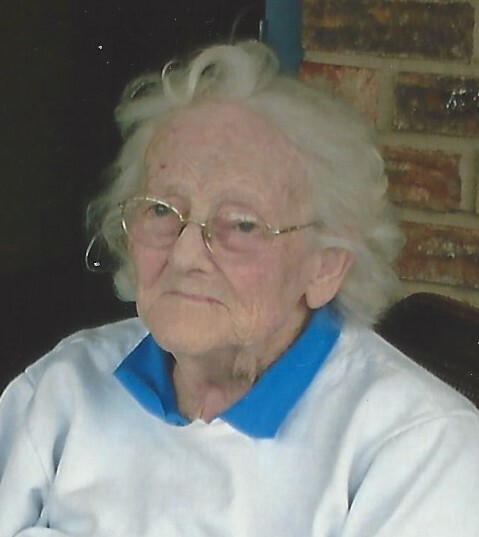 Opal was a loving mother and enjoyed sewing for her grandchildren and making all kinds of crafts and floral arrangements. She worked over thirty years at Genesco Shoe Co. in McMinnville, TN. And also at Levi Strauss and Lion Uniforms at Rock Island, TN. After retiring she enjoyed going to yard sales, quilting, crocheting, and growing flowers in her flower garden. She also enjoyed collecting ceramic chickens and dolls. She was a member of the Spring Hill The Baptist Church in Walling, TN. She loved gospel singings and gospel music. She also had some favorite country music and songs and loved the Grand Ole Opry music. One of her favorite dreams come true was riding in a helicopter in Gatlinburg, TN at the age of 70. She will be missed by all those in the nursing home whom she sang with and played bingo with. Carson Rust and William Myers were her best friends and she looked forward to each day and the activities they included her in. Survivors include her children, Gail Margeson and husband David of Walling, TN, Donna Faye Rutledge and husband William of Walling, TN. One granddaughter Rochelle Crowe Mullins and husband Rodney of McMinnville, TN. One grandson Jeffery Thomas Rutledge and wife Carol of Hazel Green AL. Great grandchildren, Jasmine and Hollie Mullins and Eric Rutledge. Two step-brothers Larry McBride of Rock Island, TN and Gary McBride of Smithville, TN. Step-daughter Joyce Wood Rice and Gerald of Sparta, TN. Step-grandson Burl Rice and wife Jane of Sparta, TN. Step great grandsons Eli and Samuel Rice. Step granddaughters Lanita Roth and husband Jeff of Avon Park, FL. Lisa Mason and husband Scott of Avon Park, FL. Step great grandchildren Noah and Rori Roth, J.J. and Emily Mason of FL. Sister in laws Willie Jo Wright of Sparta, TN. Jean Wood of Manchester, TN. One brother in law James Wood of Walling, TN. Many nieces and nephews. She was preceded in death by her parents, husbands, George Lins Arnold and Lewis Thomas Wood, Four brothers, Thurman, Clifton, Othel, and Robert Wright, Her Five sisters, Claris Cope, Lois Mozell Vaughn, Mary O’Dell Clark, Beatrice Humphrey, Ruth Geneva Wright. One step-daughter, Anna Hagewood. Service will begin at 2:00PM Saturday, November 24, 2018 at Thurman Funeral Home. Internment Mount Pisgah Cemetery.